Many people divide the entertainment areas of their homes into indoor and outdoor areas. 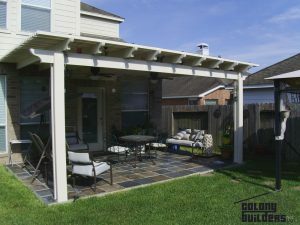 Patios and sunrooms, however, bridge the gap between the two. They are attached to your home and have many of the amenities of indoor living while also giving you a great view and access to the outdoors at a lower cost than a regular addition. When you decide to make this addition to your home, you want to take the steps that give it the most appeal for you and your family. These additions are incredibly versatile. They can function as a cozy den, a well-lit studio or extra space for entertaining. You can install a fireplace and a comfortable chair for quiet nights of reading with a view of the stars. You can mount a TV on the wall and have lots of seating, perfect for your yearly Superbowl party. Before contractors begin construction, though, you want to talk to your designer about your vision for the room. Patios and sunrooms are most useful when they have a clear purpose. Once you have a basic purpose in mind, it’s time to start planning your addition. Survey the available space to make sure construction won’t interfere with any pipes or wiring. Make sure your plans are in compliance with local laws and HOA rules. One of the many benefits of working closely with your designer and contractor is that they are typically well-versed in the statutes that govern home additions, so they can help guide you in that respect. After handling the technicalities, you get to plan the fun part! Many people want lots of windows in their sunrooms, so you can choose the windows that fit your space the best. Decide what kind of door you want to lead out of the main house and if you want a door that also leads outside. Having the basic structured planned allows you to decide if you want any built-in cabinetry to enhance the space. Patios and sunrooms are smart additions to a home. They cost less than a typical upgrade while still giving you more space.